My word, these books are so amazingly good. Brigid Kemmerer never fails to disappoint, and Spirit is every bit as wonderful as I'd hoped it would be. From the fast-paced plots, stellar writing, hilarious dialogue, and great character development, this series really sticks out from other paranormal books. Hunter is such a great main character. I mean, wow. I never liked him in the previous books, but with Spirit, Brigid has managed to turn him into a sympathetic character that I grew to love. I'm just blown away by her amazing talent to make you feel for these characters and root for them. Hunter suffers a lot in this book, and I can't even count the number of times my heart broke for him. Of course, the rest of the characters are every bit as good. It's interesting getting to see the Merrick brothers through Hunter's eyes. I ended up loving Michael Merrick, in particular, even more in this book. He's just such a support and a real friend for Hunter when he needs one. And Kate? She was awesome! I didn't love her as much as, say, Becca or Layne, but she was still great. I love how she and Hunter would text each other so much. I know it sounds like it'd be annoying, but it was actually a quirk that made their relationship so cute and real. I suppose the romance could be considered insta-love, but just like in the previous book Spark, it's written in such a way that it seems realistic rather than cheesy. I'm so impressed with the way Brigid writes romance, she's seriously good at writing relationships. And then there's the plot, which has so many surprising twists that I could barely keep up! There was always something big happening, be it an action scene or character development. I loved it. 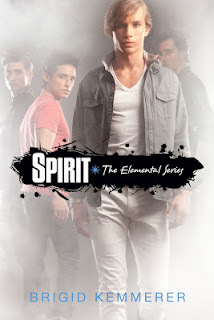 Needless to say, I adored Spirit and can't wait to read more books in this series! (Why does Michael's story have to be the last? I need it nowww!) If you haven't read this series yet, I highly recommend it! There's so many great characters and exciting plots. Amazing!